If you want to add a little glitz to your life, or if you've ever dreamed about carrying around a gold bar everywhere you go, now you finally can. Along with the usual black and white color options, Apple just announced that the iPhone 5S will come in gold. It looks like solidified champagne. The gold iPhone isn't an entire gold brick though. Similarly to the iPhone 5, which combined black with slate and white with silver, the gold iPhone is two-toned. The metal body is all gold, but the front side looks just like a white iPhone and the back side will have two strips of white at the top and bottom of the phone. But other than being a little (a lot?) 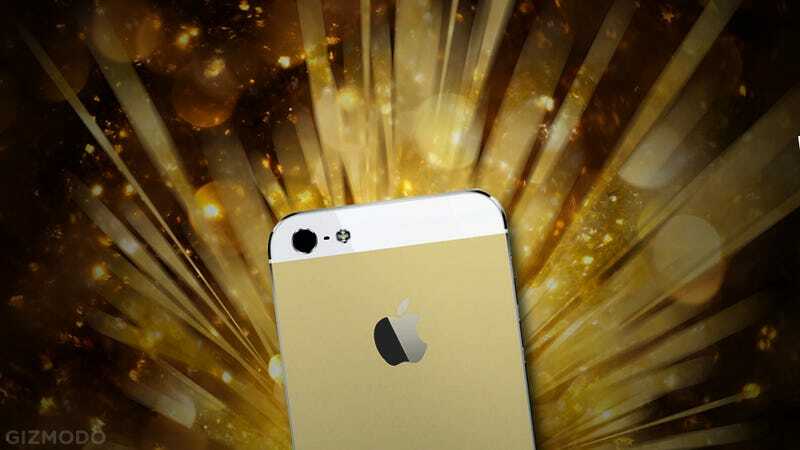 more garish than a typical iPhone, the gold iPhone packs the exact same internals as the newly announced iPhone 5S.